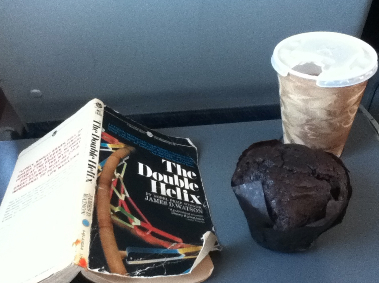 Last week I had some traveling to do and took the opportunity to reread a classic. 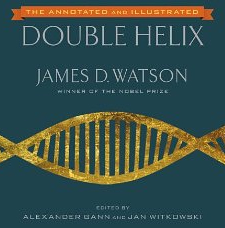 The Double Helix is James D. Watson’s personal account of the discovery of the structure of DNA (1953), for which he, Francis Crick, and Maurice Wilkins were awarded the Nobel Prize in 1962. It’s a relatively quick read, dwelling less on science and more on the research atmosphere in post-WWII England and the struggles of those involved in the race to discovery DNA’s structure, including Rosalind Franklin, Erwin Chargaff, Linus Pauling, and other famous names from genetics textbooks. If Dr. Watson is anything as a writer, he is straightforward, and his unflinching account of the events is just fascinating. Watson met Crick at the Cavendish Laboratory (Cambridge University) in 1951, when he (Watson) came over from the U.S. on a fellowship to join a small group of researchers working on the structure of proteins. At the time, physicists and chemists around the world were rapidly engaged in solving the structures of important biological molecules, aided enormously by the development of X-ray crystallography techniques pioneered by William Astbury. One of the world’s leading chemists, Linus Pauling (Caltech), had used X-ray images of proteins to determine that their secondary structure formed a helix (the alpha-helix). Proteins were a hot topic, and the world wasn’t yet convinced that DNA had an important role to play. Watson, by his own admission, was wandering around Europe (ostensibly to learn biochemistry) and trying to find something that really interested him. His background was virology; a field serendipitously connected to the transfer of genetic material in the form of DNA. At Cambridge, Watson and Crick immediately struck up a friendship fueled by their mutual interest in DNA. They wanted to work on it but encountered a delicate situation: Maurice Wilkins and Rosalind Franklin, of King’s College in nearby London, had been working on that problem for some time, hoping to solve it through X-ray crystallography. The dilemma was even more troublesome because Maurice Wilkins and Rosalind Franklin were having their own problems getting along. The relationship with Wilkins and Franklin got off to a poor start. Watson and Crick had built a [grossly incorrect] model of DNA in which the nucleotides were on the outside, and invited the King’s College pair to come and see it. Franklin was convinced that the sugar-phosphate backbone must be on the outside of the molecule, and Wilkins believed her. They were quick to point out the faults of the doomed phosphate-in model, and also rather offended that these two upstarts were trespassing on their area of research. It was a huge debacle, after which Watson and Crick were told (by the head of their laboratory) to stay away from DNA. Meanwhile, everyone was watching Linus Pauling and holding their breath. He’d already solved the alpha helix, and was actively working to solve DNA’s structure. There was a moment of dread when the group in England got word that Pauling had submitted a paper proposing DNA’s structure as a triple helix. Watson and Crick managed to get an early look at this through Pauling’s son, who was currently their office-mate. They immediately saw obvious flaws in Pauling’s proposed model — it was wrong — but they knew it was only a matter of time until he came up with the right answer. (Side note: I found an interesting chronicle of the race to solve DNA from Pauling’s perspective, put together by Oregon State University). Meanwhile, Watson was accumulating some compelling data of his own. He and Crick were convinced that DNA had a helical structure, though they could not agree on a configuration that would satisfy chemistry, physics, and the growing body of data. Watson came across two pieces of evidence that were critical to reaching the answer. 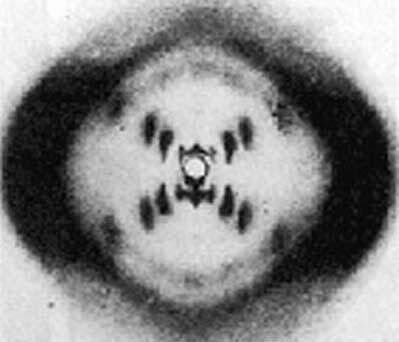 The first was Photo 51, an X-ray diffraction image of DNA in the hydrated “B” form taken by Maurice Wilkins and Rosalind Franklin. There is some controversy about how Watson got a look at this photo. He’d stopped by the Wilkins lab to point out how Pauling’s model was wrong. He had an altercation, of sorts, with Franklin and was rescued by Wilkins returning from lunch. And then there was Chargaff, whose measurements of the proportion of the four nucleotides in various DNA isolates showed that amounts of adenine (A) were proportional to those of thymine (T), and amounts of guanine (G) were proportional to that of cytosine (C). This vital observation contributed to Watson’s intellectual leap: the base-pairing between A & T and G & C.
I won’t spoil more of the Double Helix, because I think that anyone working in our field should read it. One might imagine that the author’s direct writing style paint a more accurate picture of the politics and personal conflicts that do exist, for all appearances to the contrary, within the walls of ivory towers. A new annotated/illustrated version of the book comes out in a few weeks to commemorate the 50th anniversary of the Nobel prize awarded to Watson, Crick, and Wilkins (1962) for their discovery of DNA’s structure. For all her contributions, Rosalind Franklin was not able to share the prize. She died in 1958 of ovarian cancer at the too-young age of 37. It occurred to me recently, while refereeing a manuscript, that publication in research is a lot more forgiving than publication in fiction. I’d just read a rather long-winded introduction section and noted several grammatical errors. This is not uncommon during peer review, but it continues to surprise me. Granted, some authors may not be writing in their native language, in which case small mistakes are bound to happen (and perhaps slightly more forgivable). But often it’s just a lack of proofreading. You might be surprised to learn that the world of fiction writing is substantially more competitive than scientific publication. If this had been a short story or novel (and I an editor or first reader), that manuscript would be in the trash after the third mistake. Top scientific journals receive hundreds of submissions per month, and perhaps 10% of those will be accepted for publication. Magazines that publish fiction receive thousands of submissions per month, and less than 1% will be accepted. One reason for this difference is the barrier to entry. Research requires equipment, funding, and expertise. The people who conduct it have generally spent two decades or more in school. And in most cases, it takes a team of such individuals to put a publication together. Fiction writing, in contrast, has no barrier to entry. Anyone can do it, though not everyone should. High school dropouts number among the industry’s greatest successes. Another important difference lies in the process of review. In science, though editors are certainly involved, your manuscript is essentially reviewed by other scientists in your field. They likely have similar qualifications as yours; they might have published similar studies in the same journal. They may very well be competing for the same research funding. But peer reviewers will make an effort to be fair, and if they don’t like your manuscript, they will tell you why. For the most part, they will be polite about it. Publishers of fiction don’t have peer review. The first person to read your manuscript is usually someone called a “slush reader.” This is often a poorly-paid recent college graduate (and aspiring editor or publisher) whose job is simple: read everything that comes in, and reject most of it. Unless you’re a bestselling author of some renown, there are no free passes. If there are typos or grammar mistakes, or your story just doesn’t interest them, it will be turned down. Often via the dreaded “form rejection” (a generic letter along the lines of “Dear Author, thanks but no thanks”. Critique and suggestions for improvement are rare. Slush readers and editors just don’t have the time. If you’re looking to publish a novel, you can’t even approach major publishing houses directly. First you need a literary agent. This is someone who will help you revise your manuscript and then try to find a publisher for it. Legitimate agents don’t charge anything up front; they’ll collect a 15% commission upon making the sale. But most have full client lists, and might take on one or two new authors per year. Research and fiction publishing do have something in common: track records matter. Publications are everything, and the more high profile, the better. Biomedical research is a highly competitive field. We are all competing for a limited amount of research funding, and success rates for grant applications are reaching record lows. Publication and recognition directly impact our ability to obtain funding to continue research. Just as important discoveries and landmark publications bring funding opportunities and career success, a lack of thereof will have dire consequences for an investigator’s future. In fiction writing, publication credits are equally (if not more) important. To be published indicates that you are capable of writing something that others are willing to read, and that alone is the basic qualification required for professional writers. But the odds of success are daunting. Your chances of having a short story or novel published are perhaps 1%. Your chances of being able to write for a living are much lower than that. When all else fails, there’s something else that both researchers and authors can do. 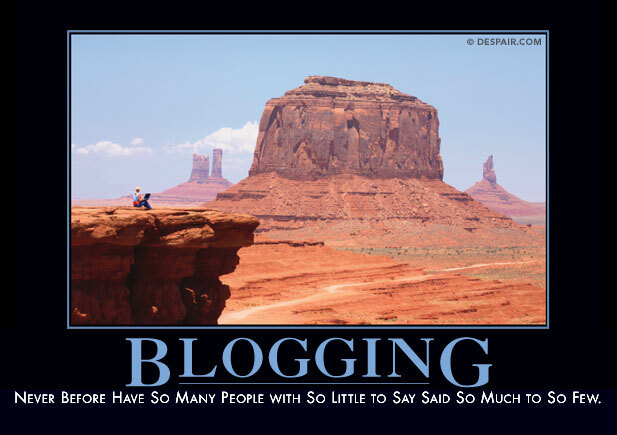 They can turn to blogging.